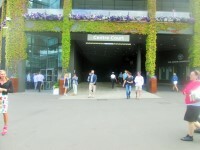 You are on Routes to Centre Court. Skip to the next section. 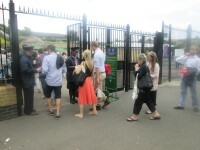 For information about Gate 5 and the route to Centre Court please click here (opens in new tab). You are on Approach (Gate 3 Piazza to North Road Entrance). Skip to the next section. The surface of the approach is tarmac. 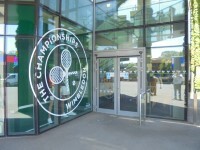 You are on Outside Access (Centre Court - North Road Entrance). Skip to the next section. This information is for the entrance located at the north east corner. The width of the door opening is 680cm (22ft 4in). 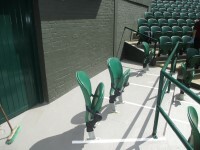 You are on Outside Access (Centre Court - St Mary's Walk Entrance). Skip to the next section. This information is for the entrance located at the north west corner of the court. The width of the door opening is 370cm (12ft 2in). 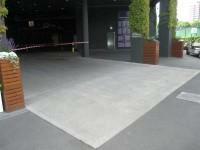 The entrance is 370cm(12ft 2in)wide. 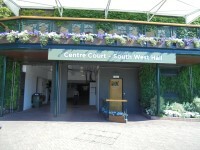 You are on Outside Access (Centre Court - South West Hall Entrance). Skip to the next section. This information is for the entrance located on the South West corner of Centre Corner, off the South Concourse. 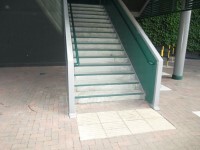 The ramp/slope is located just beyond the entrance. 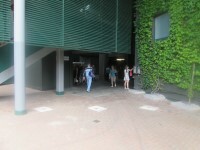 You are on Outside Access (Centre Court - South East Hall Entrance). Skip to the next section. 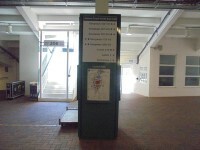 This information is for the entrance located just off the South Concourse. Handrails are not easy to grip. 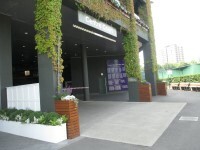 You are on Outside Access (Centre Court - South East Entrance). Skip to the next section. 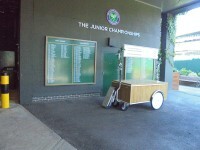 This information is for the entrance located on the south east corner of Centre Court. 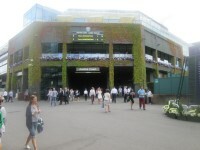 The doors are held open and attended by a steward during the Championships. You are on Other Floors (South East Entrance). Skip to the next section. 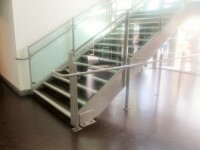 The floors which are accessible by stairs are G-5. 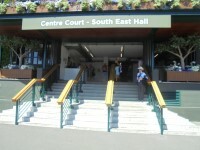 You are on Lift (Centre Court Lift - South East Entrance). Skip to the next section. 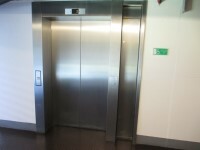 The floors which are accessible by this lift are 2,3,4 and 5. 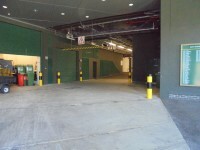 The lift is 45m (49yd 8in) from the Gate 5 entrance. 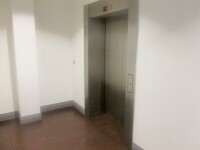 The dimensions of the lift are 200cm x 140cm (6ft 7in x 4ft 7in). The lift is manned and operated by a steward. A flip-down seat 50cm from the lift floor is fitted here. The lift is appropriate for those with tickets in Gangways 521 or 517. 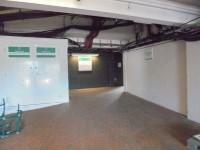 You are on Other Floors (North West - Centre Court Level 1-5). Skip to the next section. 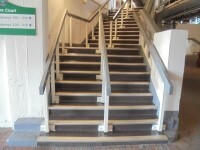 The floors which are accessible by stairs are levels 1 and 5. 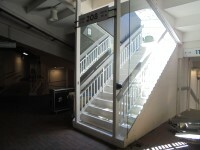 There are several similar staircases leading to various areas of seating. 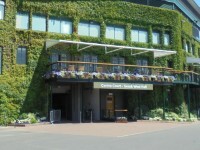 You are on Lift (Centre Court Lift - North West). Skip to the next section. 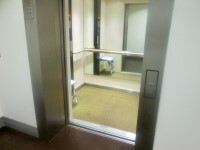 The floors which are accessible by this lift are 2 and 5. The lift is approximately 54m (59yd 2in) from the North Road entrance. The dimensions of the lift are 188cm x 130cm (6ft 2in x 4ft 3in). 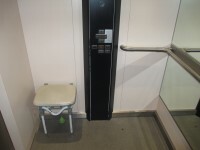 A flip-down seat 50cm from the lift floor is fitted in this lift. 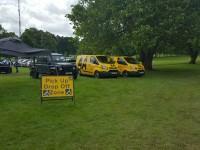 The lift is located 5m from the St Mary's Walk entrance and 54m from the North Road entrance. 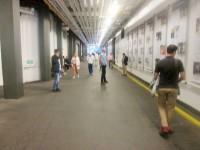 The lift is appropriate for those with tickets in Gangways 507 or 517. You are on North Road Concourse, North East Hall, North West Hall and South West Hall. Skip to the next section. 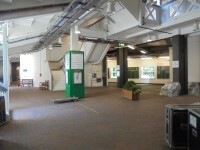 The North Concourse is located between the North Road Concourse entrance and the St Mary's Walk entrance. The surface of the path is concrete. There is step free access along the path. 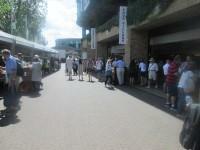 The is a long slight slope running along the concourse. 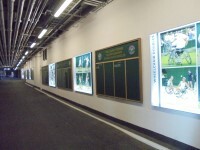 There are honour boards on the walls of current and past Wimbledon champions. There are drinking water taps located along the North Road Concourse. 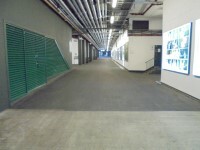 The North East and North West Halls are located of the North Road Concourse. The South West Hall is located of the South Concourse. There is clear signage throughout the concourse. 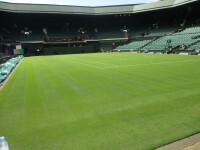 There are maps of Centre Court and the grounds. There are some slight and steep slopes or/and steps leading to the Level 1 and Level 2 Gangways. There are 15+ steps leading to Level 3 and Level 5. 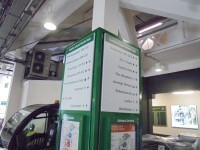 The South East and North West lifts can be used to access Level 5. 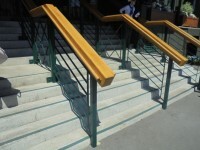 There are steps with handrails on both sides leading to the seating area. 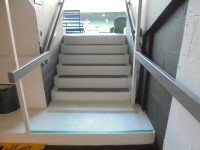 The number of steps varies depending on the Gangway. 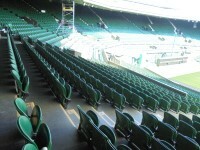 Once in the seating area there are 1 to 15 plus steps to access the rows of seating. 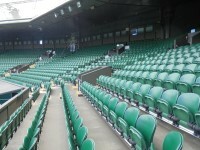 Centre Court match commentary is available on 96.3FM or via the Wimbledon App. You are on Designated Seating Level 1 - North West Hall. Skip to the next section. Wheelchair seating is available on level 1. 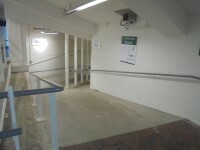 Access to the wheelchair seating is via the North Road concourse. 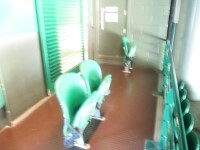 Access to seating is via Gangway 109. 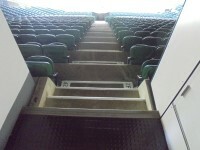 There is a steep ramp leading down to the seating area. There is a steward located at the gangway who can provide assistance with the steep ramp. There is space for 5 wheelchairs. Companions can sit beside you. 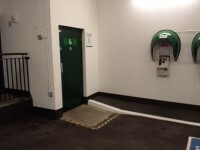 The closest accessible toilet to this seating area is on the North West Hall and in the concourse..
You are on Designated Seating Level 1 - South West Hall. Skip to the next section. 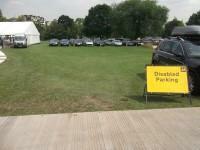 Access to the wheelchair seating is via the South West Hall. Access to seating is via Gangway 101. 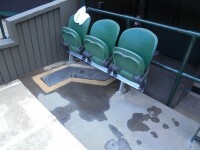 There is a steep ramp leading to the seating area and stewarding assistance is recommended. There is space for 3 wheelchairs. The closest accessible toilet to this seating area is on the South West Hall. You are on Designated Seating Level 5. Skip to the next section. 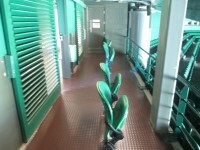 Gangway 507 – 6 wheelchair spaces/6 seats (North West Lift 9m). 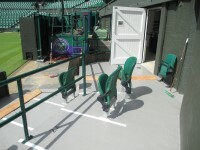 Gangway 517 – 9 wheelchair spaces/9 seats (North West 5m or South East lift 37m). 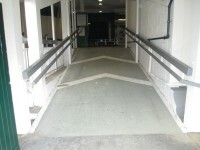 Gangway 521 – 5 wheelchair spaces/5 seats (South East lift 4m or North West lift 22m). There is space in total for 20 wheelchairs. The view from this area is restricted as the roof slopes down but there is full view of the playing area. The closest accessible toilet to this seating area is 6 metres. 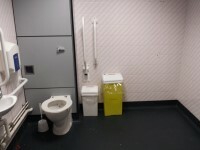 The accessible toilet is located in the corridor behind the seating area. You are on Accessible Toilet(s) (Centre Court - North Road Concourse). Skip to the next section. This accessible toilet is located in Centre Court on level 1, along the North Road. 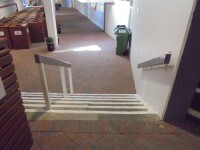 There is ramped/sloped access to the accessible toilet. 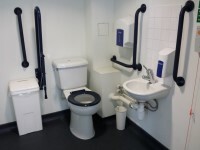 The dimensions of the accessible toilet are 150cm x 190cm (4ft 11in x 6ft 3in). 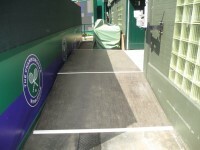 You are on Accessible Toilet(s) (Centre Court - North West Hall Level 1). Skip to the next section. This accessible toilet is located in Centre Court on level 1, opposite Gangway 106. 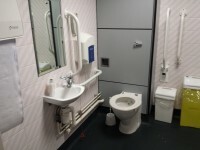 The dimensions of the accessible toilet are 180cm x 204cm (5ft 11in x 6ft 8in). The height of the coat hook is 106cm from the floor. The height of the soap dispenser is 96cm. 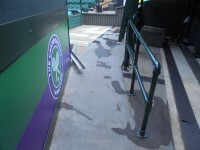 You are on Accessible Toilet(s) (Centre Court - South West - Level 1). Skip to the next section. This accessible toilet is located on level 1 of Centre Court, to the left after you enter from the South West Hall entrance. 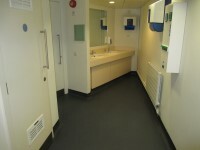 The dimensions of the accessible toilet are 240cm x 220cm (7ft 10in x 7ft 3in). The lateral transfer space is 165cm (5ft 5in). The height of the coat hook is 116cm from the floor. You are on Standard Toilet(s) (North Road Concourse). Skip to the next section. 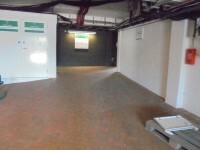 The female and male toilet facilities that were surveyed are located off the North Road Concourse. 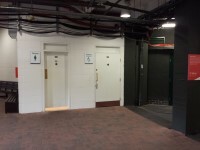 The female and male toilets are approximately 63m (68yd 2ft) from the North Road concourse entrance. The photographs show the female and male toilets respectively. 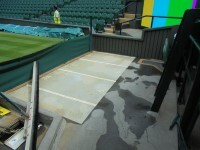 You are on Accessible Toilet(s) (Centre Court - South East - Level 5). Skip to the next section. This accessible toilet is located in Centre Court on level 5, located along the corridor and opposite Gangway 519. There is step free access to the accessible toilet, via lift. 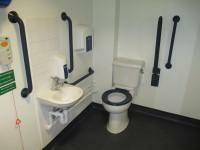 The dimensions of the accessible toilet are 180cm x 205cm (5ft 11in x 6ft 9in). There is a similar accessible toilet located on level 5 opposite gangway 517. The accessible toilet has a transfer space on the left. 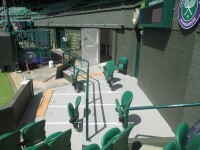 You are on Accessible Toilet(s) (Centre Court - North West - Level 5). Skip to the next section. This accessible toilet is located in Centre Court on level 5, to the right after you exit the lift opposite gangway 507. 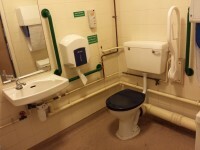 This accessible toilet is approximately 7m (7yd 1ft) from the lift. 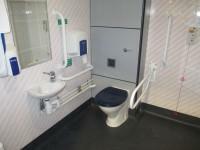 The dimensions of the accessible toilet are 170cm x 220cm (5ft 7in x 7ft 3in). 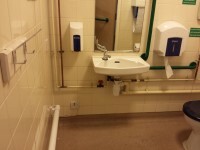 The height of the soap dispenser is 95cm. You are on Standard Toilet(s) (Level 5). Skip to the next section. 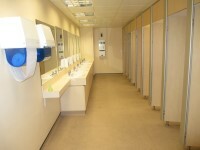 The female toilets are located on the level of 5 concourse. 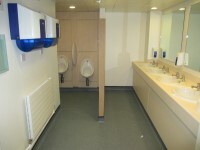 The female toilets are 10m (10yd 2ft) from the North West lift. 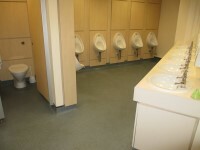 The male toilets are located on the level 5 concourse. The male toilets are 19m (20yd 2ft) from the lift. The first two photographs show the female toilets, the third the male.